Ever since I first heard of the proposal for a wind farm on the hills around the Allt Duine in the Monadh Liath mountains I’ve been planning on spending a few days and nights in the area to really gain a feel for what it is like. I’ve been up three times to view the area but these day walks always felt no more than touching the surface then turning away. Finally I decided it was time to go up there, camp and have a look round. The Allt Duine itself is a short hill stream, only around a couple of kilometres in length before it joins the River Dulnain. 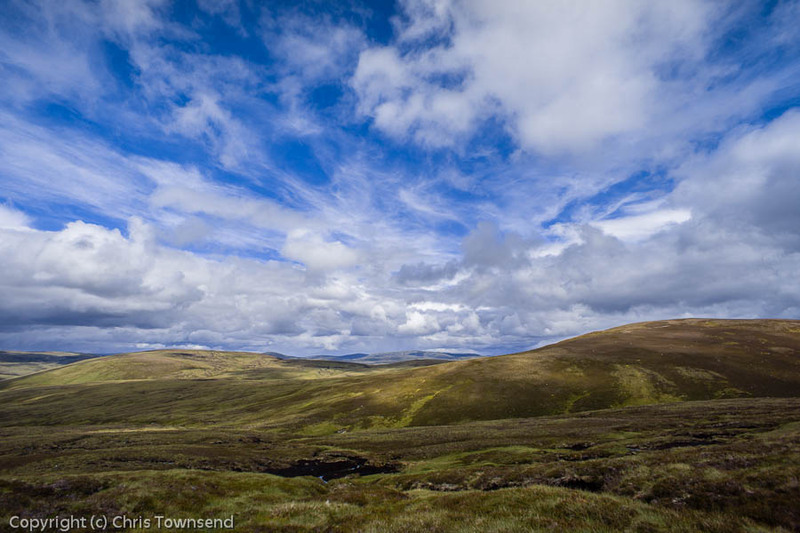 The area across which the wind farm will be spread if built lies between the Dulnain and its watershed with the River Spey, which is also the boundary of the Cairngorms National Park. Two Corbetts (Scottish hills between 2500 and 3000 feet/762 and 914 metres high) lie at either end of the Allt Duine area. 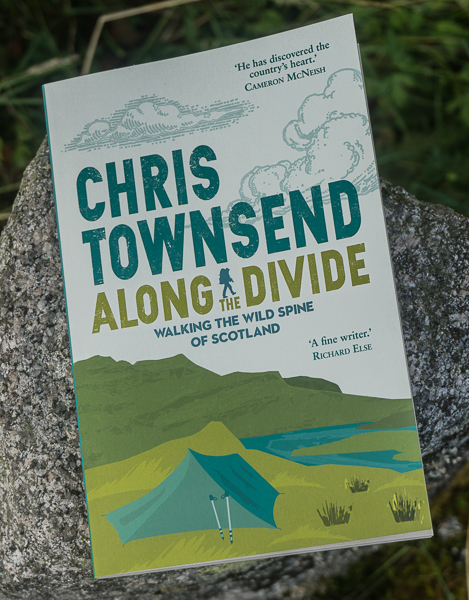 It was my intention to walk the watershed between these hills and also follow the Allt Duine and the upper River Dulnain. Dawn revealed an attractive moorland stream running through steep banks of heather and blaeberry with occasional little rock outcrops. 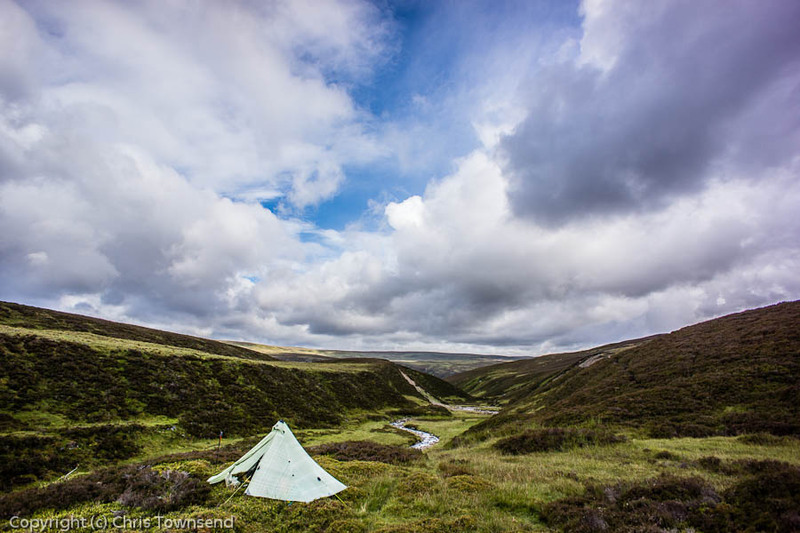 My camp was on a knoll above the stream and I had a view downstream to distant, flat-topped hills and a spreading bright sky streaked with racing white clouds. 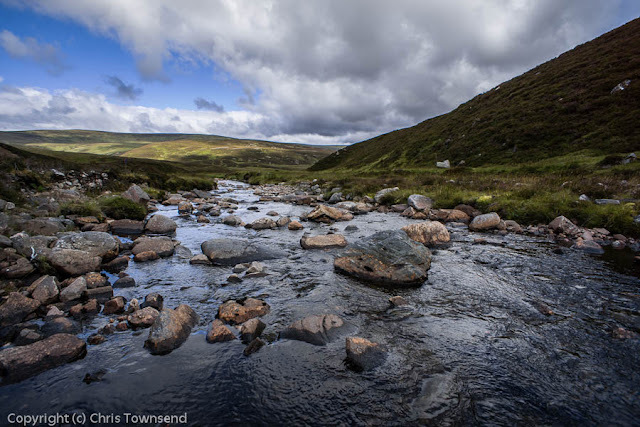 I followed the Allt Duine down to its confluence with another little burn, the Feithlinn, then wandered up beside this stream to a bulldozed track that led over a moorland spur to the River Dulnain. As I picked a way through the wet meadows beside the Feithlinn I caught a glimpse of a large bird taking off from a bank above the stream. Turning I watched as a golden eagle flapped slowly up the glen, its huge wings beating effortlessly as it stayed low over the water. There were many other birds in these little stream valleys – curlews, wheatears, common sandpipers, carrion crows – but it was the eagle that stood out as a symbol of the wild, as evidence that this was a special place. Crossing the spur between the streams I passed close to a tall anemometer, one of many dotting the Allt Duine hills in preparation for the industrialisation that may come. Tethered by long silver wires the thin metal spire was an alien intrusion in this natural world. Down at the Dulnain I was back with just the wet meadows, moorland slopes and rushing river for company. Eventually I left the river to climb the long northern slopes of the western Corbett, Carn an Fhreiceadain (watcher’s cairn). Nearing the summit I was disappointed to find a new bulldozed road with a large cleared area next to it. This was a cambered road with drainage ditches either side. I could have driven my car up it. It went almost to the summit cairn. From the top I could look back over the whole Allt Duine area to Geal Charn Mor and west to the higher Monadh Liath hills. Across Strathspey the hills were hidden in dark clouds. From the north similar clouds were sweeping towards me. The first rain began to fall before I left the summit. I’d already had my waterproof jacket on and off four times as showers came and went. Now it went on for the fifth and final time. I’d wear it until I made camp. From Carn an Fhreiceadain I followed the twisting watershed over a series of minor moorland tops – Beinn Bhreac, Meall a’Chocaire, A’Bhuidheanaich. Once the Fhreiceadain road was left there were no paths other than sheep and deer trods. On the summits the going was easy over stony ground and sparse vegetation. In the cols and on the flanks it was much harder with many steep-sided peat bogs to negotiate, some filled with black pools and dark trickling streams. Mountain hares, a favourite prey of golden eagles, darted everywhere while grouse called and often I heard the thin plaintive whistle of golden plover. A series of squalls passed by, leaving bits of rainbows in their wake. I made my second camp just below a col with a wide view over the Allt Duine area. Rain kept me in the tent however and it was dawn before I could really admire the wild scene. First light gave a dappled sky with a hint of pink and touches of blue but the clouds soon thickened and it was overcast when I set off back to Geal Charn Mor with mist creeping up the hillsides from Strathspey. The summit was clear though and I looked back over the Allt Duine hills to Carn an Fhreiceadain and down to the hidden River Dulnain. I felt I knew a little about this place now. 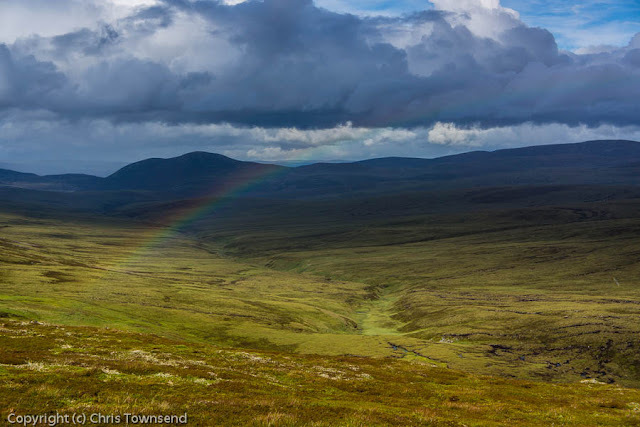 Then I turned away and soon the Allt Duine area was lost to view and I was descending the Burma Road looking over the green Strathspey woods to squalls of rain sweeping across the Cairngorms. Then I was in the trees and at the car and soon afterwards sitting in an Aviemore café staring out at torrential rain hammering down. 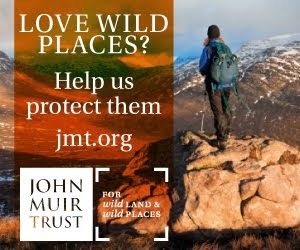 Great piece Chris' could do with something like this in the national press to show the value of the wild land, and how important it is to preserve these areas from development. 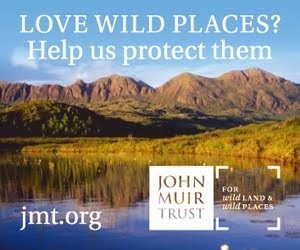 The fact that its rarely visited by humans, makes it even more valuable to the wildlife that survives there. To lose this wonderful area to industrialisation would be criminal. All these windfarms only get built because of the grants & subsidies available to the landowners. The money wasted on these things would be better spent on energy conservation. If every house & office was properly insulated & every computer & TV was switched off completely when not in use then you could actually close a power station or two. Excellent. Love that last picture Chris. Shame you didn't have the camera quick to hand when you saw the eagle, mate. That would've been a cracker. It's a crying shame the area is being considered for 'industrialisation' though. Fingers crossed it never happens. Beautiful scenery and photos - fingers crossed the planned action doesn't go ahead, what a travesty that would be!